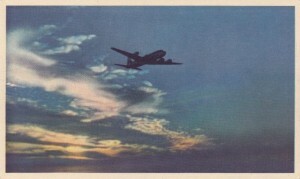 Nowadays, whenever you board an aircraft as an “economy” passenger, usually the most prevalent thoughts on your mind are, “How long is this flight?” and “I wish I was there now!” Perhaps as a business class traveller, and certainly as a first class traveller, these thoughts are not as prevalent. But at the end of the day, the modern day traveller mostly just wants to “get there”. But…it was not always this way, was it? 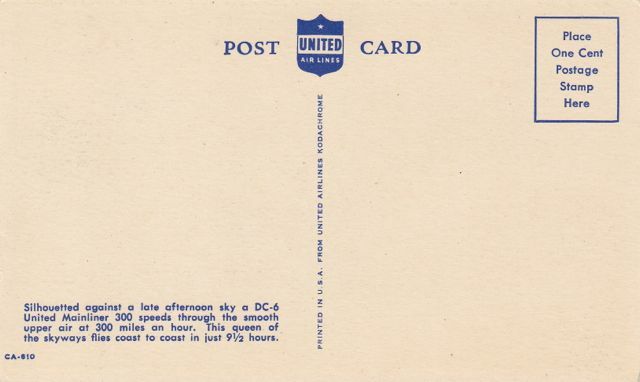 As illustrated by this classic one cent (pre-1952) card from United Airlines, there used to be more of a romance about “getting there”. I suppose you could say the same for many things today…we are always on the go, wanting to get to where we are headed, not really appreciating the journey. And that’s why I love this card. It’s not about the destination. It’s all about the journey. A beautiful silhouette of this DC-6 against the setting sun…a calm smooth journey through the painted sky…and only 9 1/2 hours coast to coast! A United marketing masterpiece to be sure! 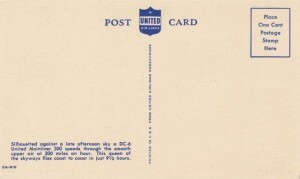 This entry was posted in Douglas, Postcard, United Airlines and tagged DC-6. Bookmark the permalink.